Host Jem Schofield gives an overview of the Canon C200 and C200B digital cinema camera systems. This episode explains the differences and similarities of the two models, takes a look at the design features, external accessories, sensor, processors, recording capabilities, touchscreen LCD, electronic viewfinder, inputs and outputs. Get familiar with the location and functions of the camera’s buttons, dials and controls. In this episode, host Jem Schofield explains the Function (FUNC) button controls, examining White Balance, Iris and Shutter control, and the options when adjusting white balance, shutter, gain and aperture to achieve great results. Explore some of the key Menu features and how to set up the Menu for your projects. Host Jem Schofield looks at buttons, dials and switches, activating LUTs, saving and loading camera settings, time code, video outputs, assignable buttons, the Status menu, My Menu features, and more. Host Jem Schofield explains the audio recording and monitoring capabilities of the Canon EOS C200 and C200B cameras. He walks you through setting up either 2-channel or 4-channel recording, and shows how to adjust and monitor the microphone levels using the Mic terminal, XLR inputs and camera body microphone. 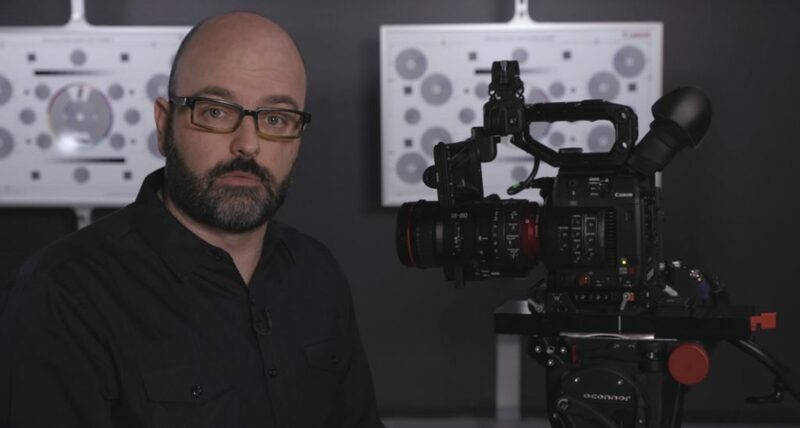 In this video, host Jem Schofield demonstrates strategies for shooting with the Canon EOS C200 and C200B for best results. He goes in-depth about shooting with the cameras including the Focus Guide, focus assistance functions, recording formats (Cinema RAW Light/MP4), Color Space, Gamma and Custom Pictures/HDR settings, HDR/LUT options, exposure recommendations using the waveform, proxy recording, and more. In this video, host Jem Schofield demonstrates the key features of Dual Pixel CMOS Autofocus and touchscreen control of autofocus to get you ready for shooting with this important camera option. Take a close look at Special Recoding Modes and explore the options for remote control operation of Canon’s EOS C200 and C200B camera systems. Host Jem Schofield takes a close look at slow motion recording options based upon recording format. Also, look at how to remotely operate the cameras when they are out of reach by using the Browser Remote feature and a computer, smartphone, or tablet. Host Jem Schofield is joined by post-production experts Loren Simons and Nicholas Recano to explore the best practices for working with Cinema RAW Light in a variety of post-production workflows including Cinema RAW Development software, BlackMagic Design DaVinci Resolve, and Avid Media Composer. Also, visit Canon Burbank’s DI Suite to examine at the intricacies of finishing a project with an OpenEXR/Aces finish using SGO’s Mistika color grading and finishing system. Canon announced today that they are bringing the triple lens kit to the EOS C200. Much like the “Triple Lens” kits that accompanied the C100 AF and C100 Mark II in the past, this lens kit includes three of their latest lenses: the 16-35mm f/2.8L III USM lens, the 24-70mm f/2.8L II USM lens, and the 70-200mm f/2.8L IS II USM lens. All three L-Series lenses share an f/2.8 aperture, and combined they fully cover an impressive focal range. These three lenses make this kit versatile and a great choice for filmmakers who are trying to get the most out of their gear. The C200 Triple Lens Kit is priced at $11,999 and qualifies for Canon’s promotional financing program (0% for 24 months, 1.99% for 36 months). Canon expects to start shipping this kit at the end of 2017 — a fast approaching deadline! If you’re interested in this kit, you can always preorder online or with one of our sales associates. If you’re interested in financing this package for as low as $310/month, apply online in minutes with our online application for lease credit. 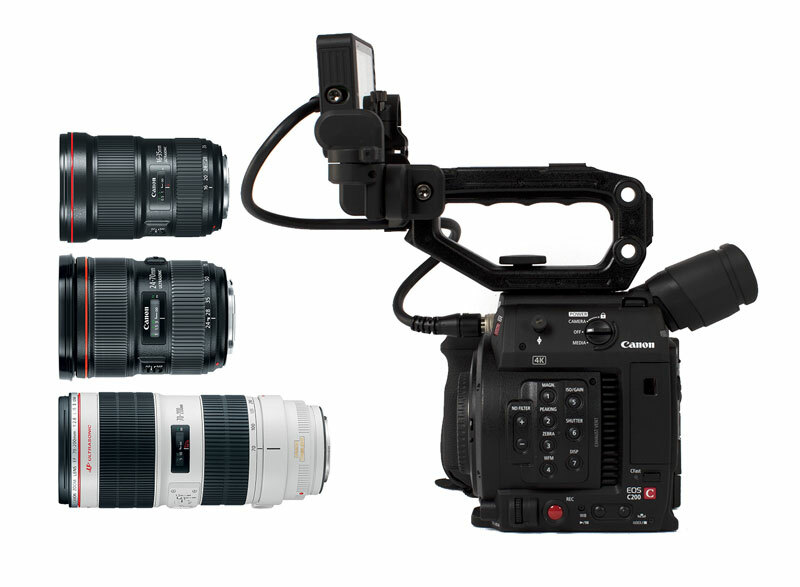 Canon also announced two different kits for the EOS C700: the EOS C700 MultiDyne 4K Kit and the EOS C700 MultiDyne HD kit. These kits expand the current C700 EF 19mm ARRI Pro Kit with either a 4K or 3G camera back and base station from MultiDyne. We’ll be posting more information on those kits as it becomes available. The EOS C200 Digital Cinema Camera is a “ready-to- go” production camera that comes with a built-in electronic viewfinder and an array of accessories including a 4-inch touch screen LCD monitor, a versatile handle and ergonomic handgrip. The camera can record internal 4K RAW to a CFast™ 2.0 card in our new Cinema RAW Light format without compromising detail, as well as 4K UHD and Full HD in MP4 format to SD cards. The 8.85 Megapixel Super 35mm CMOS sensor, 13 stops of dynamic range, Dual Pixel CMOS AF, full compatibility with Canon EF-mount lenses, and HDR capability help make the EOS C200 ideal for film, documentary and television production, corporate and event videography, and newsgathering. The EOS C200B version comes as a standalone camera body, excluding the built-in electronic viewfinder, LCD monitor, handle and handgrip. This will allow the user the flexibility to customize the camera with a wide range of accessories to fit their specific needs. The EOS C200B’s smaller form factor allows it to be used in tighter spaces, and more easily attached to a gimbal or drone. Canon’s announcement included the pricelist of $7,499.00 for the C200 and $5,999.00 for the EOS C200B models. Though Canon’s popular 0% Financing Promotion for its Cinema EOS Line has not yet been extended to include the C200 or C200B, even with standard financing you should be able to own one for under $200/month (either model). You can join our waitlist on each individual product page, or check out the press release or on the Canon website. Below is a video shot on the C200: From Dock to Dish.